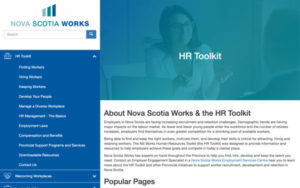 HR Toolkit is an excellent resource developed under The Nova Scotia Department of Labour and Advanced Education, Workplace Education. It’s a one-stop HR information and learning centre for small- and medium-sized enterprises (SMEs). Discover ideas and tips, practical guides, checklists, downloadable templates, and links to other relevant resources that will help you find, keep and develop valued employees. Programs under the Workplace Initiatives Division are available to help Nova Scotia companies increase business capacity through HR development, skills training and workforce productivity. They provide flexible and affordable options for the typical small- and medium-sized company to acquire HR expertise that can improve viability and competitiveness. Free access to hundreds of online courses ranging from software applications to customer service to HR fundamentals to accounting essentials. Private learning plans can be set up and courses assigned. Information, tools and resources to support employers as they tap into the unique and beneficial blend of skills, abilities, and perspectives that diverse employees bring to the workplace. Funding and supports are available to help you develop and implement training programs tailored specifically to meet the needs of your organization and your employees. Financial incentives are available to encourage employers to hire Nova Scotians requiring work experience and to register and employ apprentices. Funding is available to support companies to invest in developing the knowledge and skills of their workforce. The AHBRSC concentrates on researching and understanding our industry, our communities and our economy in order that we can project the demand for new home construction and renovation and strategically prepare for the human resources needed. These efforts are undertaken in partnership with the Nova Scotia Department of Labour and Advanced Education and are targeted at SMEs as residential employers/companies — new home builders, renovators, and trade contractors. Interested in helping us build a stronger sector in Nova Scotia? Participate in our next online HR Needs Assessment Survey, coming in Winter 2019. The 2014 survey provided valuable insights on the priorities for our industry as the most important issues and challenges facing companies and residential trades in the sector in Nova Scotia — different options for residential training, essential skills for employees, ways to attract more people to the residential trades. As the AHBRSC prepares for renewal of the sector council Strategic Action Plan with the provincial government in April 2019, let us know what you want to see included.